William Young Duggan was a Major in the United States Air Force when he went Missing in Action in Laos on 31 December 1971. Duggan was born on 07 May 1935, and his home city of record is Leander, Texas. When North Vietnam began to increase their military strength in South Vietnam, NVA and Viet Cong troops again intruded on neutral Laos for sanctuary, as the Viet Minh had done during the war with the French some years before. The border road, termed the "Ho Chi Minh Trail" was used for transporting weapons, supplies and troops. Hundreds of American pilots were shot down trying to stop this communist traffic to South Vietnam. Fortunately, search and rescue teams in Vietnam were extremely successful and the recovery rate was high. Still there were nearly 600 who were not rescued. Many of them went down along the Ho Chi Minh Trail and the passes through the border mountains between Laos and Vietnam. Many were alive on the ground and in radio contact with search and rescue and other planes; some were known to have been captured. Hanoi's communist allies in Laos, the Pathet Lao, publicly spoke of American prisoners they held, but when peace agreements were negotiated, Laos was not included, and not a single American was released that had been held in Laos. 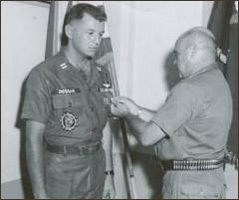 On New Year's Eve, 1971, Maj. William Y. Duggan (posthumously promoted to LTC. ), pilot and Capt. Frederick J. Sutter, bombardier/navigator (military records show the positions reversed - Duggan's family states unconditionally that he was the pilot on the mission) departed on a mission over Laos in their F4D Phantom fighter/bomber jet. Their target area was near Na Phao in Khammouane Province, Laos - the Ho Chi Minh Trail. Sutter and Duggan did not return from their mission, and were declared Missing in Action. Like other families whose men were missing, the Sutter and Duggan families waited for the war to end, hoping always that their sons had been captured and would eventually come home. For Herman and Mary Sutter, Fred's parents, history was repeating itself. Herman Sutter had been a prisoner of war during World War II, but returned home. His aircraft had exploded at 10,000 feet, but he survived. Both believed Fred could survive against tremendous odds as well. In January 1973, the U.S. and Vietnamese signed an agreement in Paris to end American involvement in the second Indochina War. Laos was not part of the negotiations, and as a result, the "tens of tens" of American prisoners the Lao stated they held were never released. In fact, not one single American held in Laos was released then or since. Were it not for the thousands of reports concerning Americans still held captive in Southeast Asia, the Sutter and Duggan families might be able to close this tragic chapter of their lives. Fred's father died not knowing what happened to his son. Duggan's son and daughter were only 10 and 9 when their dad was lost. What must they be thinking of us? It's time we brought our men home. Duggan was the recipeint of an ABLEAERONAUT Award and had been an instructor pilot. At the time of his mission he was a senior pilot with over 400 combat missions and at the time of his downing had flown more combat missions in Southeast Asia than any other serviceman. You can read additional information as provided by the family here. Biographical and incident of loss information was obtained from either POW/NET and/or Task Force Omega, Inc (unless otherwise noted). Additional information may be found via remembrances at The Vietnam Veterans Memorial Fund or The Virtual Wall Vietnam Veterans Memorial.